Every household growing tea plants also grows Tsurunoko, a variety of Kaki around the tea farm. November to December is off-season of tea farm, and suitable for making Hoshigaki(dried kaki). Ujidawara was said to be the birthplace of 煎茶sencha. Green tea production was started in the late Edo period. The sweet korogaki can be suitable confectionary to green tea. A magazine published by Omotesenke, a head school of Japanese tea, which indicates kaki is the first confectionary served at tea ceremony, and chagashi, confectionaries in Kyoto have been created based on the sweetness and hardness of Korogaki. There are many fruits available in Japan, but persimmons are different to pears or grapes in that they are much older. They can of course be eaten raw, but are even more nutritious eaten dried, as they contain larger amounts of potassion. The peel is also nutritious. In Ujidawara, Korogaki is first served in 13th Dec. Its origin dates back to Zenjo-ji temple. 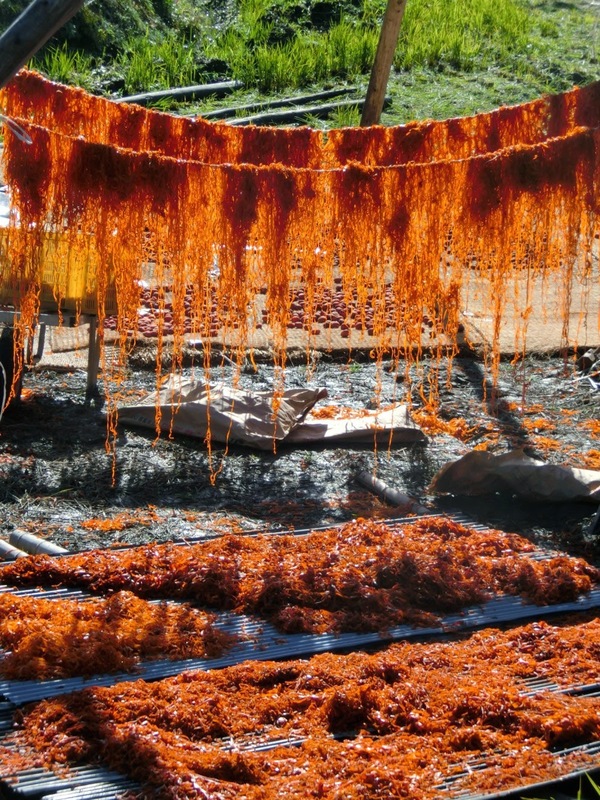 There is a story that a lady told villagers how to make hoshigaki (dried kaki). Peeled off, dried on kakiya, which is unique buildings to dry kaki in Ujidawara, and it’s ready to eat after 2-3 weeks. There is a Kaki tree thicker than 2 persons surrounding the tree. It is said that at least 200 has passed. Nagatani Souen, who invented Sencha, 270 years ago. Korogaki maybe existed around that time. "People could not have enough rice before. They survived by eating kaki. After harvested rice in fall, kaki can be harvested in Dec. Dried kaki can be last longer when there is no rice left." Said a tea farmer in Ujidawara. Farmers coat their tea farming tools in persimmon juice as a sterilizing agent, which has a strong odor. Tea absorbs odors very easily, whether from makeup, cream or oil. But for some reason, persimmon juice does not seem to impact the fragrance of the tea at all. So tea and persimmons make a good match right? It is interesting how both came to be cultivated together. Persimmons and tea are well matched, but persimmons also aid the saké making process too. Persimmon juice was used to coat wooden sake barrels, and it is said that it stopped the brew from going bad or being discoloured in sunlight. After harvesting rice, Kakiya (drying house) is built along the valley of Ujidawara. 6 people are working togher to build one kakiya. The roof is thatched by straw. The materials are recycled and used for 10 years. The process is dependent on weather conditions, and so if temperatures drop as we expect, then there is no need to do anything. Lately, winters have been warmer and more humid, so that is making it difficult. There is a specialist of just "peeling off". Experienced peelers can finish peeling 500 kaki per day. There are 5000 kaki, and farmers should crumble kaki twice a day. It is indeed time consuming job. Where are significant differences in temperature between the night and daytime, as well as the summer and winter seasons, there is good quality tea. "Most people don’t like the bitter cold, but we farmers don’t complain and rather than complaining, “it’s cold today, isn’t it?” we say, “it’s a good day for the persimmons, isn’t it?”"
Korogaki can be eaten from mid December to the end of January.